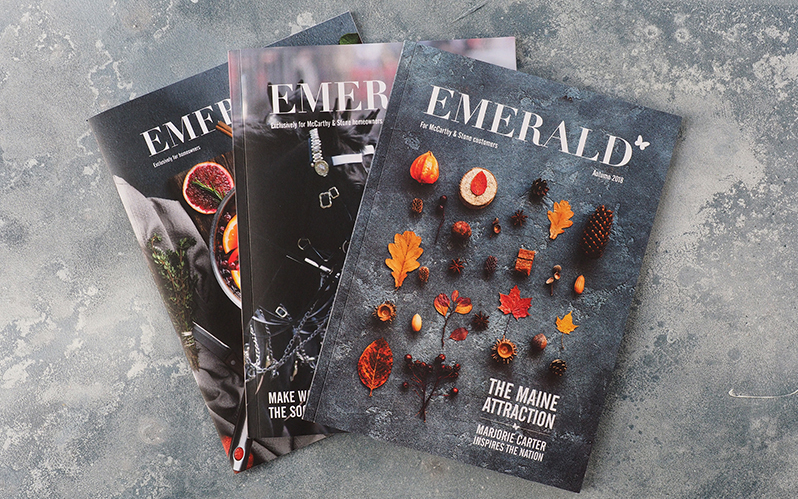 The autumn saw the launch of the third edition of Emerald Magazine, a lifestyle publication exclusively for McCarthy & Stone homeowners. The seasonal magazine is by far one of our favourite projects here in the Studio, inviting the whole team to take part from feature ideas, copy writing, design and print. In this edition, New England’s Maine in autumn was the main attraction, encouraging everyone to step outside to see the colour-change on their own doorsteps. The most delicious Parkin recipe inspired readers to bake the traditional bonfire night treat, while a feature looked back on Guy Fawkes’ famous tale and another celebrated Diwali. On the 100th year of Armistice, we included a piece reflecting on Remembrance Day and McCarthy & Stone’s charitable support. The magazine introduced homeowners to the organisation’s intergenerational project which, launched here in Sherborne, sees their customers volunteering at a local primary school – an initiative we wholeheartedly support and have enjoyed helping to come to life. And among the English wines to buy, this season’s books to read and competitions to enter, we shared the many extraordinary life stories of the homeowners themselves. Already pencilling concepts for issue no. 4, we very much look forward to seeing the next copy unfold in the New Year. The Biggest Story in Town!